for the Christmas Open House. This little tree in it's own whitewashed sleigh. and those that arrive with the chandeliers I have here at home. I also have picked up some of these drops at garage sales and flea markets. I never really had any idea what I wanted to do with them...Just knew I liked them. Well, It finally hit me as I was getting things ready for this Open House. I would use these wonderments to decorate a small scale tree! Some are not real crystals at all.. Most are lovely in their own right! All together they made a precious little treasure! added a antique battenburg lace collar as a tree skirt... the little sleigh I found this summer at a garage sale...It was a funky gold and red! And well...as you can see it's quite charming! has a new home somewhere other than the store! I only hope that it is loved and well cared for. Happy White Wednesday to one and all! For more White Wonderments...Visit Faded Charm! Kathleen always has such lovely posts! Please keep my family in your thoughts and prayers today! So...much happening right now! GORGEOUS!I hope your Wednesday is simply delightful. Please keep my lil Emily in your prayers she was diagnosed with a mild case of SWINE this evening :(, she is doing well but, I still worry. I am so tired right now that I can hardly keep my eyes from closing so I did a quick scroll down your post, and saw your prayer request. I am about to retire to bed so I will pray for you before I drop off to sleep! Lovely, lovely pictures. I love it!!! So creative and beautiful...the little sleigh is the perfect touch!!! Donna I love your lovely tree and that sleigh is beautiful! What a great way to use all those cyrstals. I have been picking them up over the years as well, but haven't done anything with them yet. Thank you for the inspiration. Your family will definitely be in my prayers. You will be at the top of my prayer list. 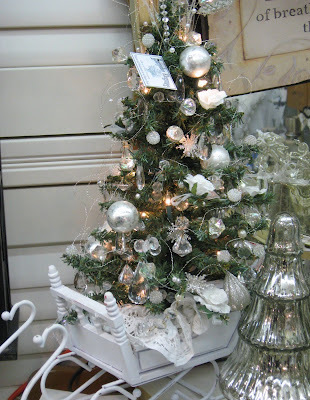 These are such dreamy Christmas images, I love the whites and silvers so much. And don't even get me started on the crystals! Grrrrl! Oh Donna I'm glad I didn't miss this post, you know how much I love Christmas!! Such a lovely tree and sleigh...can't wait to see what else you do for Christmas!! Thank you for stopping by and taking the time to leave me a comment! I love reading them~they truly make my day!